Open EIFS is an Exterior Insulation and Finish System that achieves high moisture resilience through increased drying capacity and redundant, yet practical, safeguards. When implemented holistically, this assembly is both durable and high-performing. The concept builds upon research originally conducted by DOE’s Oak Ridge National Laboratory, which demonstrated high moisture performance in EIFS configured with 4” EPS and without cavity insulation and interior vapor retarders. This pivotal study was performed in the hot-humid climate of Charleston, SC 1-3. Hygrothermal analyses for the same design have demonstrated quality performance in a number of challenging climates including Seattle, Boston, and Minneapolis. 1) High Drying Capacity – Removing the interior polyethylene vapor retarder is a critical first step in accommodating anticipated water penetration on the intended drainage plane. This enables the assembly to dry to the building’s interior. To a lesser degree the wall also dries to the exterior as facilitated by the drainage channel-substrate interface and passive air exchange. Integrating a permeable fluid-applied air/water barrier over a moisture-resistant glass mat substrate and a permeable interior finish provides the basis for an air-tight yet vapor diffuse assembly. 2) Dew Point Location – By removing cavity insulation, the interior face of exterior wall sheathing is maintained at near-interior temperatures. This places the dew point safely within the EPS or drainage spaces where vapor is readily released to the exterior. 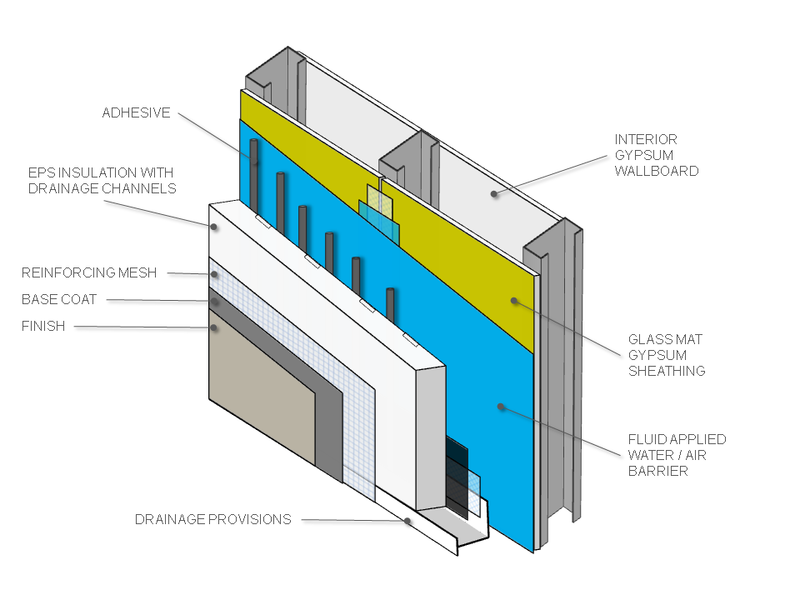 3) Safe Moisture Storage – Depending on the source of water, expected moisture burdens are safely stored within the EPS, highly diffusible gypsum substrates, and the buffering capacity of the wall cavity’s air space. By design, the assembly minimizes storage and maximizes a high rate of moisture movement safely and predictably. 4) Drainage – In a perfect world, the intended 1/8” space offered by the notched trowel configuration provides adequate drainage, but we know that these spaces are imperfect and generally closer to 1/16” or even 1/32”. This results in a greater likelihood of moisture bridging, which leads to increased absorption and higher moisture accumulation at the drainage plane. Greater drainage efficiencies and reduced moisture absorption are achieved with drainage channels in conjunction with adhered, notched trowel applications. The depth, width, and spacing of these channels should be specific to your design’s drainage and venting requirements. 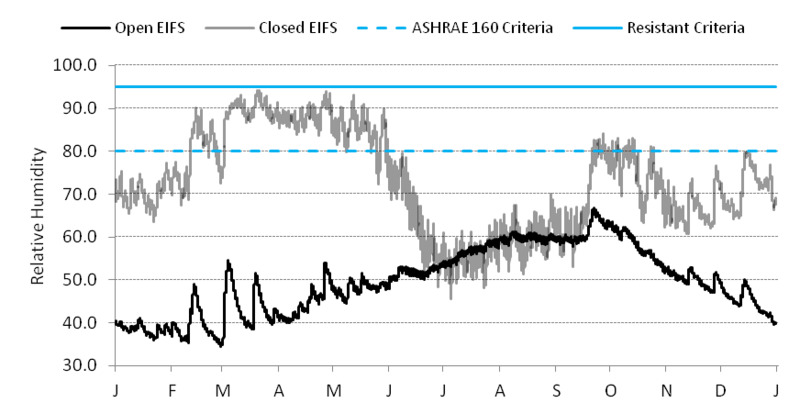 The minimum anticipated water penetration against the weather-resistive barrier should be 1% of the water that strikes the exterior surface of the building. 5) Pressure Equalization – Surface cracks coupled with negative pressure represents an important failure mechanism for EIFS. Pressure equalized systems, which are vented at the bottom and closed at the top, significantly reduces capillary drive due to pressure differences across the building enclosure. These differences are due to dynamic forces (wind) as well as static forces (mechanical systems). Pressure equalization requires three simple components that are already part of well-designed drainage EIFS: a) air/moisture barrier; b) air chambers; and c) adequately-sized vent openings. Foresight in design can achieve a PER that accommodates anticipated pressure loads while simultaneously and cost-effectively addressing drainage and passive ventilation. 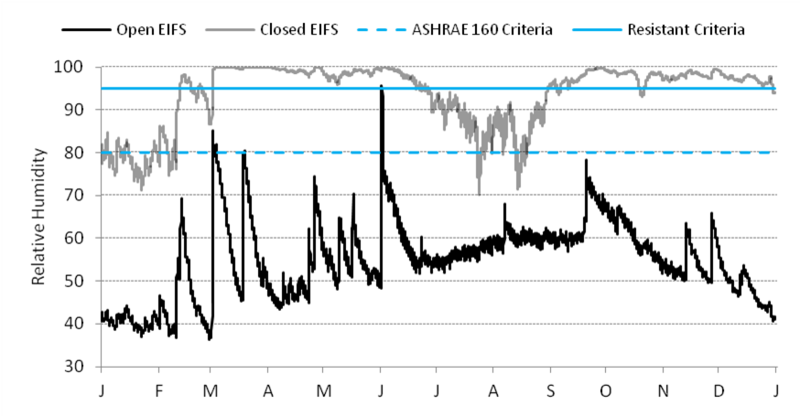 Vastly improved resilience is readily apparent by comparing modeled moisture performance of an open EIFS system to a conventional EIFS assembly, referenced here as ‘Closed EIFS’. I have modeled two assemblies using climate data for Minneapolis, Minnesota. Open EIFS is configured with 4 inches of EPS, no cavity insulation, and no interior vapor retarder. The Closed EIFS reflects a common configuration having 2 inches of EPS insulation, 6 inches of cavity insulation, and a polyethylene vapor retarder on the interior side of the wall framing. Both systems are drainable. 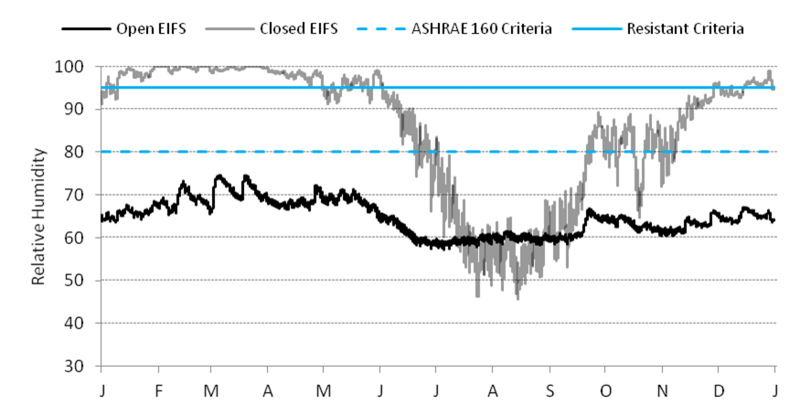 Relative humidity is reported for the interior face of the glass mat gypsum sheathing. The EIFS industry is at the precipice of a major market resurgence aided by increasing demand for continuous insulation systems and an improving perception of drainage EIFS. The demonstrable resilience of Open EIFS will provide even greater demand for this high-performing, durable cladding that could very easily attain 100 year service lives. Advancements in EPS applications at thicknesses greater than 4 inches will pave the way for a perfect solution to perennial wall problems.